So, what's at the bottom of YOUR compost pile? You have to look quite hard to see them, but this picture shows my first entirely greenhouse-grown seedlings. There are lettuces at the back and on the right of the shot, with some small spinach plants towards the bottom left. These were sown about four weeks ago in seed trays in the greenhouse and were just big enough to transplant into one of the raised beds today. Very proud of these little specks of green! 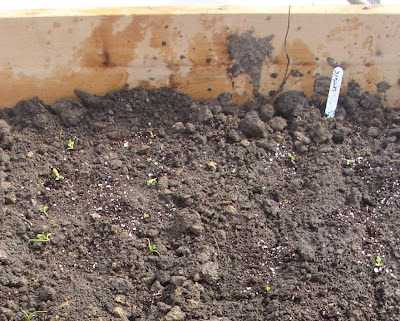 Next to them I've sown some land cress (Barbarea verna) seeds and I've also planted a couple of last year's leftover Netted Gem potatoes, in hopes of getting an early crop of those. My main seed potato order will arrive in two weeks from Alberta. 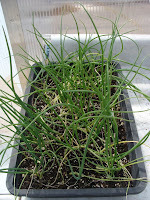 Also in the greenhouse are some of the seedlings I sowed in the warmth of the house earlier in the year, including these onions (Early Yellow Globe) which are looking happier now that they're getting light from all directions. The other day I re-sowed the peas, as the first batch had vanished completely from the eavestroughs/gutters. This time I balanced the troughs over a corner of one of the raised beds (instead of leaving them on the floor). The peas are still in situ and are now showing signs of sprouting. I think those in the first sowing must have been stolen by mice. 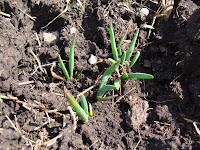 Outside, the garlic is looking better than it did when the snow first melted and the Egyptian walking onions that a neighbour gave me are poking up through the soil, too. I hadn't heard of these before, but they make new bulbs from the top of the plant, which, when they get big enough, will bend the stem down to the ground, setting down the bulbs to grow into new plants. After last year's complete failure of the onion crop, it looks like we will have plenty for 2009. 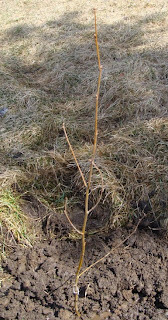 We also got around to planting the White Birch tree (Betula papyrifera) that was a gift from the organisers of the Green Homes Tour on Sunday. The hole we dug filled up with water quite quickly, so I was relieved to read that this native variety of birch doesn't mind growing in wet meadows! Amanda, your veg are coming along very well. I am just starting on my salad and spinach patch now. You have just reminded me about the walking onions. I got one from a friend years ago. She called it a Jerusalem Onion, but it literally walked out of the garden after several years. I loved it, but unfortunately she has passed on. Must look out for one again. Sigh! I really, really cannot ignore my garden for much longer! You're putting me to shame! Congrats on your first greenhouse-started seedlings. We've got nothing on the go this year, determined not to provide any more garden food to the deer. We're fencing this year. I'm glad to read that your Green tour went well. Isn't it wondeful when the first new shoots appear. I plant my peas in gutters too. It gives them a really good start. I'm relying on my cats to keep the mice away from my peas which I've sown outside. Whether they will bestir themselves is another matter! Having a greenhouse opens up a whole new world of early seed sowing - so satisfying!